I did a long and detailed post about the Berlin Wall in June, titled “The Berlin Wall and the Walls between Us“. 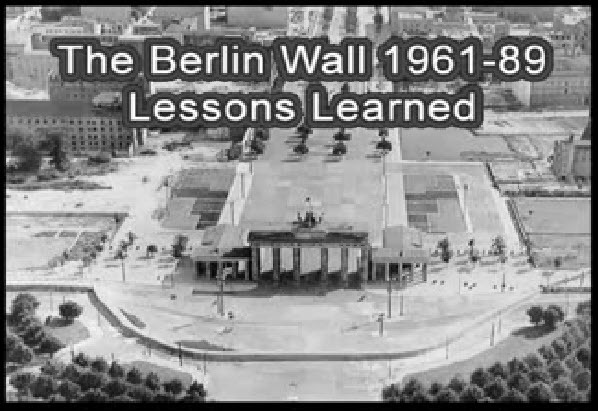 It also included a 13 minutes extended edition of my video “Berlin Wall – Lessons Learned“. It was already version 3 of the video (Here are the links to version 2 and version 1 of the video as well, just for the sake of completeness). Why the different versions? Well, there are multiple reasons. First, I improved my editing skills and was able to do things better where I was unhappy about in a previous version of the video. I also got access to new or sometimes just better quality sources. One of the latest discoveries was a high quality video version of the episode “The Berlin Wall” from the National Geographic TV series “Turning Points Of History”. That 45 minutes documentary virtually contained the video snippets of all my video sources about the 1950-1970s that I already had from elsewhere (stock footage, public domain etc. ), but in much better quality. I spent the last few days on version 4.0 of my video. This time I did re-created it entirely from scratch. It’s not just an edit of the previous version. I even re-cut, re-edited and re-sorted the sources again. This version is a whopping 30 min (almost) long. Note: Google Video messed something up. It shows only the first 5:41 minutes of the video. I will re-upload it again and try to figure out what the problem is. Once I have the full 30 minutes version up and working, I will update the links in this post. Google Video seems to be fine again. I used the Google issue period to make some enhancements to the video. It is now also slightly longer than before and surpasses the 30 minutes mark now. (30:20 min or something like that). I also updated the Link to Mediafire.com and got the AVI file-size reduced thanks to the use of H.264 video and AC3 audio compression. It’s about half the size of the previous Xvid/Mp3 encoded version, which I deleted. I also refrained from using any music that might infringe a little bit copyright here and there. It is using all Classic music (with the creators dead for far longer than 50 or 70 years). It is in some cases matching even better than the music that I used before, but unfortunately not always. I had to make some compromises for the sake of legal purity :). I don’t think that using the National Geographic documentary footage (logo blurred out) is an issue, because they also just used stock footage from CNN and other media sources. This video is not commercial in nature and CNN and others should not have a problem with my use of their stock footage. Backup link to video at Google Video. I also made this video available at the Internet Archive, where you can also watch it online and download in various different video formats, including Mpeg-4, Cinepack and OGG Video. You can find additional videos of mine about the Berlin Wall for download here. More videos about the East Germany and the Berlin Wall, including original news reel footage and documentaries are available for download at this location. Feel free to comment and tell me what you think about the video. I am also open for any suggestions, praise and criticism :). i went to your pages following your link from your Moments in History post on Youtube. Thank you for posting this. I was in Germany at the time of the fall. My family was in the Military and though we lived 2 hours outside Berlin I remember getting out of school for days for the celebration and my father who had been there when the wall went up went back to his same post when it fell and found his two friends who he had been seperated from by the Wall. I remember getting the call telling us my dad was staying an extra night in Berlin not for duty but to go have drinks with his two friends. They went to the same bar they had gone to years ago and the son of the original owner now ran the joint. He recognized the three men gave them thier same booth and told them drinks were on him. I had always heard of these men but a week later I met them. They were still dumbfounded that my dad had married a German woman and had 2 daughters. Thanks for posting the vid. It reminded me of my childhood and the feeling we all had as we felt change occuring. Do you know where I can get the 640 x 480 video – i can’t find it in the mediafire folder. I would like to know where I can find the document for the berlin wall. I would like to have a 640 by 480 version. Can not find it in the mediafire folder. I updated the link, which was pointing to the incorrect folder at my Mediafire account. It used to be correct, but the amount of video material about the subject increased and I moved everything into separate folders. I also added additional links to more options and additional video material, on Mediafire.com as well as at the Internet Archive. What was your personal experience? How do you feel now that the wall is gone? Andrew: sorry for the late response. I had it on my to-do list and then it slid off it somehow. It’s a long and detailed response though, which was worth the time waiting I hope :). It’s too long for a single comment (Blogger has a limit of 4,096 characters), so I have to split it up. I personally was surprised by the events that unfolded. I did not realize what happened in the night of November 9, 1989 and went to school as always on November 10. Half the school wasn’t there, even some teachers were not there. Nobody knew what was going on. Around noon some kids showed up and asked questions like “Hey, have you been to the Kurfuersten Damm too?” (the main street and kind of new center of West Berlin). I thought that they joked and laughed, but then other kids came talking about the same stuff. I realized that they couldn’t have possibly made the story up together and then come to school in groups, 15-60 minutes apart from each other. Somebody mentioned that there is a visa required, so me and 2 other friends went to the local police station and asked about it. They acknowledged it and we got out IDs stamped (You got your ID with the age of 14 in East Germany). We went to Bornholmer Strasse, but the border was shut. That did not surprise me, because I could not imagine that they just open the border over night and that it must have been a fluke the night before. Well, we got there around 3 pm or so and waited like the rest to see what is going to happen. The visa in my ID stated “valid from November 11, 1989″, the next day, but most other folks at the border didn’t even have a visa at all and still waited there and shouted to the border guards. I don’t know how long we waited, but the number of people started to grow rapidly at one point. I guess a lot of people got off work and flocked to the border, just as we did, only after school (which was off around 2 pm). They let some people pass, one by one, but that wasn’t enough. The increasing number of people, which all pushed towards the border created problems, because the first rows were smashed together harder and harder and it was only a matter of time, before anybody would have been injured or worse. So they opened the gate again and we flushed through the border in this bulk of people. Before we knew it, we were on West Berliner side of the border. It felt weird and for me like an entirely different city. I did not know anything about West Berlin, there were no maps. I only had one from 1960 or so. I thought about finding my way to some family members who lived in West Berlin, but then decided to stick with my friends. We heard about the 100 DM free welcome money for East Germans who visited West Germany or West Berlin and followed some folks to a bank that was nearby. The banks were of course completely overwhelmed by the flood of people that suddenly appeared to pick up their “present”. The banks didn’t make it a formality that day and gave out the 100 DM without any paperwork to be filled out. They stamped my ID with a “Date Stamp” that could have been anything and that was it. I don’t know exactly what I bought that day with my free welcome money. I think it was a pack of Tic-Tac, a Coke, a Comic and maybe some chocolate bar. Junk actually, stuff we had in East Germany too, but different (West German TV advertisement had its influence on East Germans.. Don’t know, if anybody took the time to study this kind of stuff. Would have been a gold mine for advertisers and marketers to find out what people thought about products after years of exposure by TV advertisement, without much additional exposure to anything else and with rare to no opportunity to test, taste, touch the actual product itself. Interesting thought ). I am glad that the wall is gone (and NO, I don’t have nor want a piece of it, like most Berliners). How the “Anschluss” or merge of East Germany into West Germany was handled was bad. It was driven by emotions and not by realistic thoughts. That’s the wrong thing to do when it comes to things of such scale and importance that have lasting effects well after the time, when emotions cooled down again. Everybody knows that, but many folks forgot about it back then. The people who knew the best were fired, because their suggestions did not fit the emotional climate. This mistake ended up to be a very costly one for Germany as a whole. I was probably affected by this the least, because I was young and also not stupid. For me a whole world of possibilities opened up over night. Especially my dream to have my own computer and to do something with computers professionally was fulfilling itself faster and better than I could have imagined it just a few years before. I too followed the link on your youtube page and I’m so glad I did. This video was magnificent, thanks so much for making it. The images were so poignant and the music complimented it so well. So, thanks again. And to the brave Germans who went out to protest that wall, thanks for giving some Cubans in Miami hope. Cheers! It is filled with facts and also with references to other videos and posts about the Berlin Wall that I created. Watched your video on youtube Loved it. I was wondering if I could get a source/a file sent to me with some of the video clips without the subtitled? I’m putting on a play about the Berlin wall as part of my A Level drama project and it’d be really useful if I could have some of the footage. There you can find my videos in AVI and WMV format and also other video material about the subject. The oldest source I know of, where those 3 segments were used is the black and white mini documentary “The Wall” Produced by Hearst Metrotone News Inc. from 1962 (It’s about 9 minutes long). Also see my blog post about some of the main video sources for my berlin wall videos. I hope that helps. Cheers! Next Post: What is ASCII Art? What is ANSI? and more!